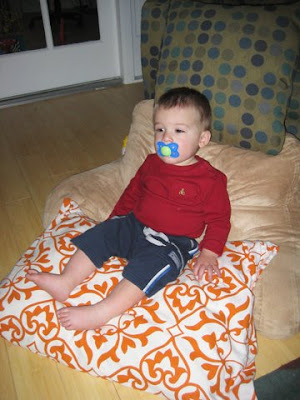 Finn is sitting in the the little "chair" I built for him, watching Baby Einstein "Numbers Nursery," while I work. But this is so unlike Finn! He's...LOUNGING! The only other time I have seen Finn lounge is HERE. What a creative chair...you made your own bean bag! He looks so dang cute and content!